The Paraclete Shri Mataji “I met a Russian who asked Me why the U.N. was helping the Muslims in Bosnia.... I was shocked at his perception of Muslims. I have such respect for so many of them. I wish they could accept that this is not Jihad time anymore but Qiyamah Time, the Resurrection Time, the Blossom Time. Are they going to miss it? The Paraclete Shri Mataji “The worst part is the practice of conversion. People are being converted from one religion to another not for faith but for non-religious reasons such as matrimony or monetary gain. Bitter fights are going on in different parts of the world between followers of different religions, all in the name of God Almighty! This cruel phenomenon is not understood by any saintly person. Groups of people claiming to profess the Islamic religion are in the forefront of these fights. There are some people who believe that Islam should be spread by Jihad. This was never the idea of Mohammed Sahib. At the time when He was here on this Earth, the people were facing a very difficult situation because there were lots of tribes, and these tribes were fighting and killing all the people who were taking to Islam. That was the time when it was alright to talk about Jihad, but today there is no such problem. Moreover by talking incessantly of Jihad, they are becoming very unpopular. Not only that, actually, they have achieved nothing. “But the Muslims do not want to talk about Resurrection at all because they want to frighten people with the Doomsday. They don't want to talk about the Resurrection Time which is going to come - which is the intermediary time - because they want to use the time which will frighten people by saying that: "Now your Doomsday is coming! Now your Doomsday is coming!" Everyone is frightened about God and they think, "Now we should just wait for our doom. 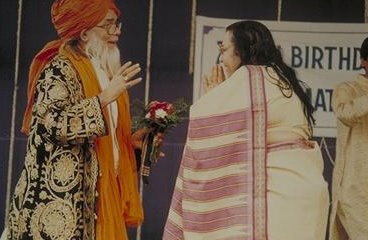 Nothing at all in between.”"
Till the advent of Shri Mataji no one could explain the parables of the Holy Scriptures and enlighten humans with priceless knowledge. It is not possible to list them here as there are just too many. So i will just briefly discuss Her quote above that, in a nutshell, turns Islam on its head. i was stunned the first time i realized that the Qur'n, without question, backed Her......... stunned because my eyes could hardly believe the verses irrefutably confirming that She was telling the Truth. Of all the chapters in the Qur'n, surah 75 Al-Qiyamah (The Resurrection) must have clearly confronted them with so frightening a prophecy and promise of Divine intervention to collect, promulgate, recite and explain in detail the only Surah entirely devoted to Al-Qiyamah, that it could only be explained away by vagueness, briefness, distortion, misinformation, untruth and outright deceit. But Allah (SWT) warned humans not to move "thy tongue concerning the (Resurrection), to make haste therewith" since "It is for Us to collect it and to promulgate it.” Then, after having announced it, they were to follow its recital. And last, but not the least, the Resurrection is "for Us to explain"- leaving absolutely no ambiguity as to Allah's (SWT) Intention. This is referred as the Great News or Great Event in the Qur'n and was to coincide with specific Sure Signs absolutely beyond human manipulation or duplication. Thus it is obvious that the announcement and detailed narration of the Resurrection to the entire human race was Allah's (SWT) sole and explicit prerogative. Now the question of making such serious allegations against so established a faith arises. How is it possible that such obvious and fundamental Truths be hidden from so many, by so few, for so long? Perhaps it must be asked: How was the Ummah deceived into speculating about Al-Qiyamah, despite Allah's (SWT) explicit, simple and clear Warning not to do so? This Al-Qiyamah website exposes the depth of deception that the Ummah has been indoctrinated over the centuries by their ulama, imams, ayatollahs, amirs, caliphs, mu'ttilah, aalims, mujtahids, mullahs and muftis on this central theme of the Holy Qur'n. Note: It is indeed sad that "Muslims do not want to talk about Resurrection at all.” Shri Mataji wished they did. i just want to say that the SYs, leaders and WCASY also do not want to talk about Resurrection at all. This is tantamount to a collective conspiracy against Shri Mataji and Her Divine Message. ...... Yet against all the odds and obstacles She has triumphed. Jai Shri Mataji!!! > centuries have retarded the religious masses. i have just received an email that confirms that the open, cosmopolitan and progressive Dubai has blocked www.al-qiyamah.org. Before i forget i want to thank the sender of this very important email from the bottom of my heart. are blocked in dubai, (and possibly in other nearby countries following same format too). i could enter al-qiyamah through the main adishakti.org site, but only one page opened, and any other links in the same page, were again leading to the "site blocked" page. so basically, anything that is written in context of this is blocked, and only "hinduistic"/ adishakti links open. i dont remember too clearly, but i think i was able to enter all those links before and they have been blocked somewhat recently. The reason you were able to open the www.adishakti.org link on Qiyamah is because the first page is in that server. All subsequent links are in the www.al-qiyamah.org server which are blocked in Dubai. Since i just did that last week or so then the www.al- qiyamah.org site must have been blocked some time ago. This being the case, then we can conclude that the majority of conservative Islamic nations have already done so. But why block a website based entirely on the Holy Koran? 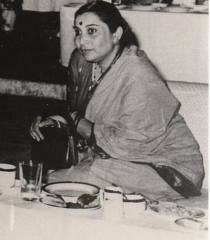 On 28 February 1990, while on Her way to Australia, Shri Mataji Nirmala Devi stopped at Changi Airport, Singapore. She informed those who had gathered to meet Her that in Islam there is a complete surah written about Her. In this surah it is stated that the Sent One will give Realization, will make you Pirs and give Collective Consciousness. But you will be non-believers. (That surah is Al- Qiyamah - The Resurrection). Mohamed Oumalek, Al Qadr will determine final destiny of all humans. Mohamed Oumalek, Al Qadr is the Night of Power because for the first time in Islam Allah's Ruh within will baptize you to resurrect yourself. "But on the contrary, he rejected Truth and turned away! Then did he stalk to his family in full conceit! Woe to thee, (O man! ), yea, woe! Again, woe to thee, (O man! ), yea, woe!" Since Muslims have been unable to challenge www.al-qiyamah.org the only defence is block the site ............... lest more Muslims ask the ulema (religious scholars) to take up the challenge, and the latter have to decline. 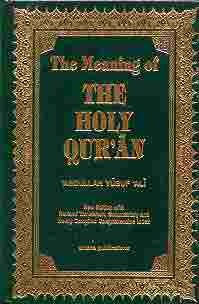 The prophecies of the Holy Koran are devastatingly precise and will run their course! Truth is indeed a double-edged sword that can be wielded to challenge the mightiest empires. There is no way i could have set up the www.al-qiyamah.org site from Muslim Malaysia, the country of my birth. Religion is a very sensitive subject there and any person posing a threat to Islam or Muslim unity can be detained under the draconian 1960 Internal Security Act (ISA) for two years without charge, detentions that can be extended indefinitely. i am not saying i would have been detained but a single warning would have effectively ended it. What can you do from behind bars anyway? Now i understand why i had to leave for Canada and become a citizen of this great nation. The Adi Shakti had everything worked out. UPROAR is still raging in Malaysia over inflammatory speeches at the annual congress of the ruling United Malays National Organisation (UMNO) in mid-November. One delegate talked of being ready to"bathe in blood"to defend the race and religion of the Malay Muslim majority against the ethnic Chinese and Indian minorities. The education minister, no less, brandished a keris (traditional dagger), only to be urged by another delegate to start using it. The affair has brought into focus Malaysians' worries that, as their country nears its 50th birthday next year, its remarkable economic and social success is at risk from the increasingly separate lives its three main races are living. Mohamed Jawhar Hassan, the head of ISIS, a think-tank, says that Malays' desire for more overt expression of their Islamic faith, and Chinese and Indian parents' desire to educate their children separately, are "social forces, much more powerful than any government.” Passing laws may not be enough to stem the drifting apart of the races. But there are few other ideas on how to preserve social harmony and prosperity, two huge achievements of which any country turning 50 could be proud.